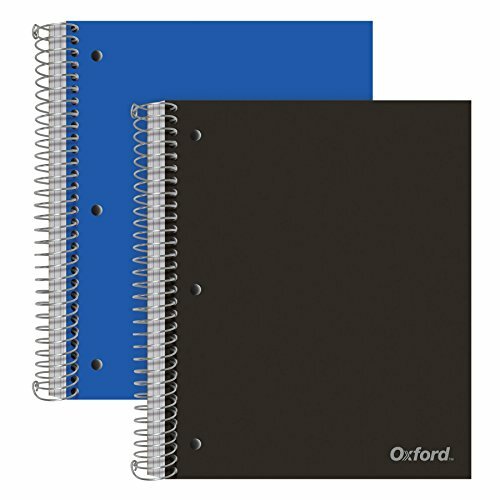 Oxford 3-Subject Poly Notebooks are a smart way to sort, organize and preserve notes for class. Covers are made of wear, tear & moisture-resistant poly that’s durable enough to protect your notes and outlast the school year. Each 3-subject notebook provides 150 sheets of pure ruled inspiration for full-color, highlighted, pinworthy notes. These spiral-bound books are 3-hole punched to fit a standard binder. A sturdy snag-resistant coil keeps your pages secure and resists catching on backpacks, papers and clothes. Micro-perforated sheets detach easily so do-overs don't slow you down. 3 Subject. 9" x 11". College ruled, 150 sheets. 3 Poly Divider Pockets. 2 Pack in blue & black. Protect It With Poly: Durable moisture-resistant poly covers save your critical notes from accidents, rainy days and spills. These covers can survive hectic hours in class, long nights of study and life inside your binder or backpack. Complete Subject Mastery: There's no simpler way to keep study notes in order than keeping one tidy, well-organized notebook per class; your spiral notebook specialists do the organizing for you. Sections Plus Bonus Storage: Three double-sided divider pockets keep sections separated and loose sheets organized and close at hand. Look for Micro-Perforated Pages: Not all perforations are created equal. Oxford micro-perforated pages rip apart with a clean edge when needed but keep the notes you need and want secure. Not Just for School: You'll find a million uses for your 3-subject spiral notebooks; they're perfect for bullet journals, to-do-lists, shopping lists, planning & general notes for home or on the go.